Yurlov Russian State Academic Choir today is one of the leading Russian music groups with its number of represented concert programs, wealth of the repertoire and breadth of performance possibilities. The Choir is the constant participant of dozens of musical projects, events and festivals that take place both in Moscow and in other regions of Russia and the world. Under the supervision of the greatest modern choir and symphony conductor Gennady Dmitryak, who has led the group since 2004, the choir has traveled almost over the whole of Russia — from Kaliningrad to Magadan. Solo concerts of the choir has gone over with the huge success in St. Petersburg, Novosibirsk, Kazan, Nizhny Novgorod, Krasnoyarsk, Chita and in many other Russian cities. The choir has still strongly been expressing the powerful traditions of Russian choral art for the audience in Spain, Greece, England, Poland, North Korea, Armenia, Latvia, Lithuania, Estonia, where the performances have recently been arranged and received the most enthusiastic feedbacks from foreign musicians. Gennady Dmitryak has managed to join sound power and flexibility, timbre richness and technical freedom in performing image of the choir. 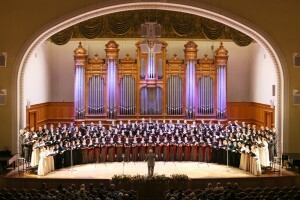 The choir nowadays is one of the largest choirs in Russia. It has more than 70 singers the vast majority of whom are young highly skilled musicians, graduates of Russian conservatories. 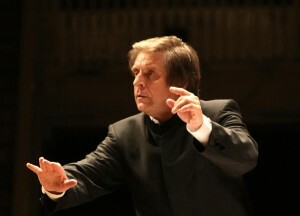 Gennady Dmitryak as music director who dedicated to the development and promotion of choral art in Russia has initiated a number of big creative projects that have become significant events of the modern Russian musical life. 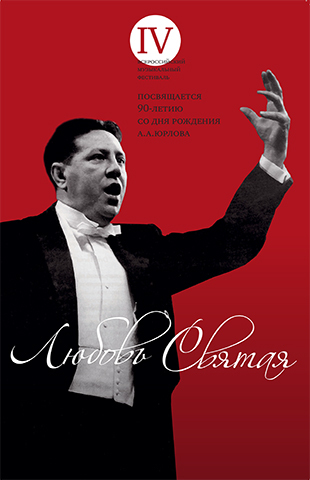 In the autumn of 2012 with the support of the Ministry of Culture of Russian Federation the choir with great success implemented the project of Music Festival «Lubov Svyataya», dedicated to the memory of the famous group leader Alexander Alexandrovich Yurlov. The best domestic professional, student and amateur choirs for the first time in lots of decades at the festival were united in consolidated choirs, which performed vocal-symphonic compositions of Russian and foreign music. 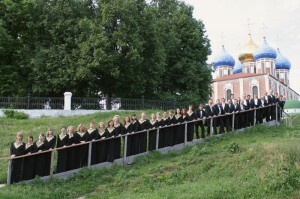 Today the Festival «Lubov Svyataya» is one of the landmarks of the Yurlov Choir. 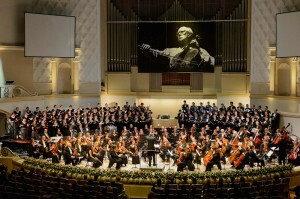 In the autumn of 2013 the Festival was arranged for the second time which allowed to implement a number of unique musical projects such as the performance of Sergei Rachmaninoff’s Vespers by 160-voice Choir of consolidated cities of Russia. During these two years among the participants of the Festival «Lubov Svyataya» there have been The Moscow State Academic Chamber Choir conducted by Vladimir Minin, The State Academic Russian Choir named after A.V. Sveshnikov, The Chamber Choir of the Moscow Tchaikovsky Conservatory, student choirs of St. Petersburg Conservatory named after N.A. Rimsky-Korsakov, the Kazan Conservatory named after N.G. Zhiganov, Gnesin Academy of music, The Moscow State University, The Moscow Engineering Physics Institute, the best Russian orchestras like The State Academic Symphony Orchestra of Russia named after E.F. Svetlanov, The State Symphony Orchestra «New Russia», The Moscow State Symphony Orchestra conducted by Pavel Kogan, The Moscow City Symphony Orchestra «Russian Philharmonic», famous Russian musicians. 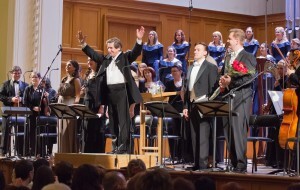 No less important initiative have become the concerts of choral music represented by the group in the ancient Russian cities within the framework of the festival «Kremlins and churches of Russia», which has been focused on the acquaintance of a wide range of domestic students with the achievements in the Russian choral art. By keeping up the Yurlov traditions the choir has cherished every opportunity of joint performance with the choir or a symphony orchestra of the city where it comes from. These touring concerts have been held with great success. «Giving concerts with the Choir in Russian cities, I find a great interest in choral music, which apparently the hearts of our countrymen missed”, — said Gennady Dmitryak. – “Obviously, it gives the Russian soul something that other musical genres cannot always give».During the recent years the choir has annually represented the subscription of The Moscow State Academic Philharmonic for music lovers. The choir subscription programs include the masterpieces of Russian and Western European classics, works of contemporary composers. 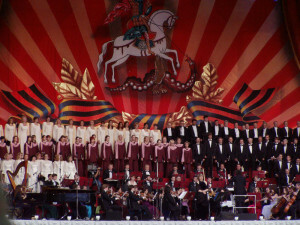 The choir is a constant participant of the Moscow Easter Festival, the Festival RNO, the International Festival named after Mstislav Rostropovich, International festivals in Spain, Greece, Poland, Lithuania, significant events in the cultural, social and political life. In early 2011 at the festival «Rios de Musica» («Rivers in music») in the Spanish city of Santander the male part of the choir presented a unique program that combined the arrangements of Russian folk songs about Volga river and choral works of Russian composers. The performances of the choir in Santander were held with a triumphant success. In the autumn of 2011 in cooperation with The Symphony Orchestra of the XXI century and its director Paul Ovsyannikov the choir performed the opera»Idomeneo» of V.A. Mozart at the walls of the ancient fortress in the center of Heraklion, this musical event was the culmination of the Mediterranean Arts Festival which was held in Crete (Greece). In December 2011 the choir was one of the main «actors» in the grand opening ceremony of the Qatari amphitheater as part of the 4th Forum of the UN Alliance of Civilizations in the Arabian Peninsula. 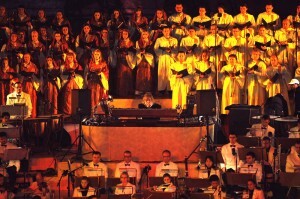 In December 2012 the choir was one of the main participants in the author’s concert of Ennio Morricone in Moscow, which was held within the framework of the world tour dedicated to the 85th composer’s anniversary. The choir also twice performed under the guidance of the legendary Italian composer in Crocus City Hall in November 2013. Bright events 2012-2014 were the concerts with the participation of the choir as part of the International Festival named after Mstislav Rostropovich, where were performed «War Requiem» by B. Britten, opera «Katerina Ismailova» and unfinished opera «Orang» of Shostakovich, a number of other compositions. In early 2014 with great success the choir performed the Requiem by J.. Verdi at the festival «Hibla Gerzmava presents …». In the spring of 2014 the choir took an active part in the preparation and arrangement of the XXII Olympic Winter Games and XI Paralympic Winter Games in Sochi. The group recorded several pieces of music performed on the ceremonies of the Olympic Game and also took an active part in the Opening Ceremony of the Paralympic Games. Together with disabled singer Julia Samoilova the choir performed the song «Together» (If You Need a Friend) specially written for this occasion, which became the leitmotif of the Paralympic Games. 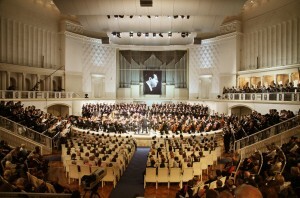 During recent years with the participation of the choir many major musical premieres have taken place, including the world ones: the Fourth Symphony for orchestra, choir and solo viola «To the 60th anniversary of the Great Victory dedicated» and «The Russian Requiem» by A. Tchaikovsky (2005), Requiem by A. Karamanov (2006), cantata «The Light guest” by G. Sviridov (2007), the opera Sh. Chalaev «The Cossacks» (2008), «The Christmas carols» by A. Larin (2009), the compositions «At the Sepulchre» J. Tavener (2009), the suite «Our home in the Universe — the planet Earth» by Vangelis (2011), L. Bernstein 3 symphonies «The Kaddish: Dialogue with God» (Russian premiere, 2012), G. Getty cantata «Joan and the bells» (2012), «The Akathist» and «Osanna, Sanctus» by A. Rybnikov (2013), the compositions «Next to the stars» and «The Spanish Guitar» by P. Ovsyannikov (2013), unfinished opera buffa «Orang» by D. Shostakovich (Russian premiere, 2014), the opera «The Black monk » by A. Kurbatov (2014). 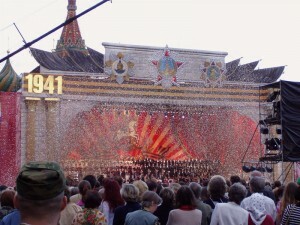 Since 2005 Yurlov Russian State Academic Choir has been one of the main participants of the annual celebrations of the anniversary of the Great Victory, which takes place on the Red Square, Poklonnaya Hill, the Central Exhibition Hall «Manezh». The choir has also much performed in other social events: concerts in honor of the city, anniversaries of space exploration, in memory of people died in radiation accidents and catastrophes, in memory of the Armenian Genocide of 1915 and others. 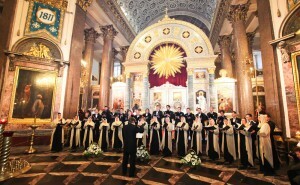 Nowadays the choir has been recognized as one of the best performers of the Russian compositions of sacred music — the group has been still maintaining a living link with the tradition of Russian church music. In May 2009 the choir has been awarded with the First Prize at the XXVIII International Festival of Sacred Music «Hainuvka — 2009″ in Bialystok (Poland) and has received also the prestigious award of the Chairman of the Polish Television. In the spring of 2014 in the framework of the XIII Moscow Easter Festival the choir performed with a huge success the program with spiritual works of Russian composers in The Assumption Cathedral of the Moscow Kremlin. In concert seasons of recent years the choir has been performing with the world’s leading music groups: The State Academic Symphony Orchestra of Russia (Svetlanov Symphony Orchestra), Russian National Orchestra conducted by M. Pletnev, State Symphony Orchestra»Novaya Rossiya», Moscow State Symphony Orchestra conducted by P. Kogan, Moscow City Symphony — Russian Philharmonic, The Russian State Symphony Cinema Orchestra. Among the symphony conductors working with Capella therse are Y. Bashmet, V. Gergiev, K. Zanderling, P. Kogan, T. Curentzis, M. Pletnev, S. Skripka, A. Sladkovsky, V. Fedoseyev, D. Yurovsky, V. Yurovsky, J. Klum (Germany), A. Weiser (Germany), B. Ellen (UK), D. Galant (UK), A. Eshve (Austria), Jean-Pierre Tortelier (France), J. Handel (USA), J. Cohn (USA), A. Mustonen (Estonia), G. Rinkevičius (Lithuania) and others. The actual repertoire of the choir includes nearly all compositions of cantata-oratorio genre of Russian and Western European music — from High Mass of I. S. Bach to the works of B. Britten, L. Bernstein, A. Schnittke, G. Kancheli, Gr. Tavener; the wonderful placer of choral miniatures — from Renaissance madrigals to music genre pictures of Y. Falik, N. Sidelnikov, A. Larin. To this must be added the Russian and Western European classical opera, extensive programs of Russian folk songs in classical and modern arrangements, the works of pop music, rock opera. By keeping the best traditions of Russian vocal-choral art the Choir today is actively developing the new spheres of musical, social life and is eager to be actively realizing its social, cultural and civil potential inside. «In the Russian choral tradition not only the ordinary chapter of the national culture should be seen, but the treasury of symbols of national unity through suffering in the long history of our country. This treasury, fortunately, is available to us, and it would be a mistake to underestimate that spiritual and cultural wealth which it keeps inside»(Gennady Dmitryak).